Around the World in 12 days! Tired of your run-of-the-mill Hollywood blockbusters? Just escape to the world of independent movies. 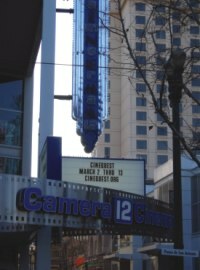 That's what I did from March 2nd to March 12th at Silicon Valley's premiere film festival Cinequest in San Jose, California. This year Cinequest 2005 honoured legendary actor Sir Ben Kingsley with an award. Who is well known for his academy award-winning performance in Gandhi. Past recipients of Cinequest awards are William H. Macy, Spike Lee, Gus Van Sant and Jennifer Beals. This was a sheer delight. Very low-budget movie filmed in the San Francisco Bay Area. Akash, an ordinary young man living in India gets dumped by his girlfriend who is looking for someone to take her to the States, so she can live a life of luxury. A heart-broken Akash decides that the ultimate revenge will be to find a "dulhan" (bride) in the States. He travels all the way to the States and checks out a number of prospects. All of which have hilarious outcomes. First time producers Manoj Kumar Sen and Atul Parikh have done an excellent job of conveying how difficult it is to find love in the crazy world we live in. This is a fast paced film noir that takes us to the streets of the ancient town of Tallin in Estonia, where a corrupt cop tries to murder his wife to obtain her inheritance. The story takes an interesting twist when someone else gets shot and several bystanders are implicated. Supermodel Carmen Kass stars in this captivating thriller. This movie gives Pulp Fiction a run for its money. A violent action movie involving a private investigator who ends up falling in love with a woman who is married to the mob. Bullets fly and a lot of people end up in body bags, but the movie has a Guy Ritchie touch that makes Lock Stock and Two Smoking Barrels look tame. It may be the year of film noir at Cinequest this year, but this movie has an added element -- a gender-bender twist. Our protagonist is trying to clean up his inherited family business. The only problem is that he likes to dress up as a girl and someone has photos to show it. Cleaning up the family business somehow becomes more complicated.